This page describes, in detail, the behaviour of Molasses Ko under AGA rules, which use Situational Superko. This rule states that "It is illegal to play in such a way as to repeat a previous board position from the game, with the same player to play." Under other rulesets we may see different results. At move 5 it is possible for Black to make a board play elsewhere, instead of passing. However this will create a different whole board position. But after the dame stage Black would prefer to pass. A White pass for would trigger the agreement phase. During the agreement phase both players point out those groups which they believe to be dead. 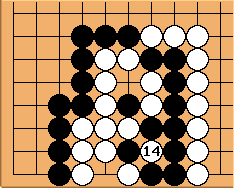 Here we assume that White tries to win the molasses ko. repeats the original position, but with White to play instead of Black. passes. A Black pass with would trigger the agreement phase. But we assume that Black tries to win the molasses ko. at would repeat the position after . This would be an illegal, but understandable mistake. Such an illegal move would be taken from the board, and Black will be forced to pass, which would trigger the agreement phase. But repeats the position after . It is also illegal. It would be removed from the board, the stones would be restored to the board, and Black will be forced to pass, leaving the following position with White to play. White now wins the molasses ko. As Black cannot win the superko through normal means, he may choose to pass on move 11. This then creates two passes in a row, which triggers the agreement phase. It is possible that both players then agree the status of the group as seki. However both players do not have to agree about the status of the group and can continue playing. (No reason for disagreement need be given under AGA rules) If White resumes and simply Passes, then Black can also Pass, triggering 4 consecutive passes. Now all stones on the board will be considered as alive. Therefore White should not pass on resumption unless he has removed all Black prisoners from the board - OR - he would win anyway under the 4 pass ruling. If White resumes and plays, a new whole board position will be created. 9) Ending the Game: Two consecutive passes signal the end of the game. After two passes, the players must attempt to agree on the status of all groups of stones remaining on the board. Any stones which the players agree could not escape capture if the game continued, but which have not yet been captured and removed, are termed dead stones. 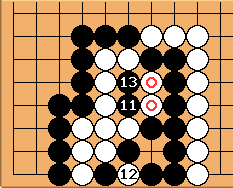 If the players agree on the status of all such groups, they are removed from the board as prisoners of the player who could capture, and the game is scored as in Rule 12. If there is a disagreement over the status of some group or groups, play is resumed as specified in Rule 10. 10) Disputes: If the players disagree about the status of a group of stones left on the board after both have passed, play is resumed, with the opponent of the last player to pass having the move. 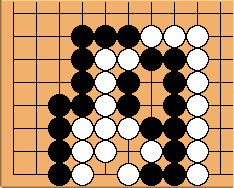 The game is over when the players agree on the status of all groups on the board, or, failing such agreement, if both players pass twice in succession. In this case any stones remaining on the board are deemed alive. Any stone or group of stones surrounded and captured during this process is added to the capturing player's prisoners as usual.